JNN 21 July 2014 Baghdad : Iraqi army forces backed by thousands of volunteers and tribal fighters have launched a major offensive against militants from the so-called Islamic State of Iraq and the Levant (ISIL) in Anbar province. Iraqi military sources say the army troops conducted the massive military attack on the al-Karma district near Fallujah city to clear the area of ISIL terrorists. Karma is one of the closest districts to the capital Baghdad that had fallen into the hands of militants. This comes after army commanders said Iraqi troops have made fresh gains on several fronts. “Vigorous military operations are still underway in Anbar’s cities against terrorist gangs, among them ISIL, which are trying to control Anbar and shed the blood of innocents,” media outlets quoted the army commander in Anbar, Lt. Gen. Rasheed Flaih, as saying. This is while Iraqi Christians are fleeing the northern city of Mosul after ISIL terrorists threatened to kill them unless they convert or pay a protection tax. 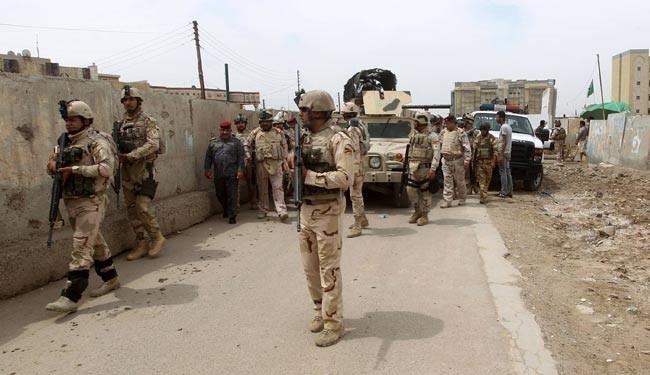 ISIS Terrorists stormed a former US base in Tikrit, a city the group has held since June 11 and government forces have battled unsuccessfully to reclaim. The latest failed attempt marks what may be the army’s final push to reclaim the lost ground. According to McClatchy DC, witnesses testified that by Friday the last of the government troops had surrendered to ISIS, and Camp Speicher had fallen. Officials in Baghdad declined to give comment . In a separate development, a series of car bombs rocked the capital Baghdad, causing casualties. The deadliest explosion ripped through the southern Shia neighborhood of Abu Dashir when a bomber blew up an explosive-packed car at a checkpoint, killing nine people including four policemen. At least two dozen people including six officers sustained injuries in that attack. Crisis in Iraq escalated after ISIL terrorists took control of Mosul, in a massive incursion on June 10. The United Nations said in a new report on Friday that more than 5,570 people have been killed and over 11,600 others wounded in Iraq since January. This entry was posted in Iraq News, Middle East and tagged Anbar, Anbar Province, Baghdad, Iraqi army forces, ISIL Terrorists, Islamic State of Iraq, Mosul, Rasheed Flaih. Bookmark the permalink.